Keeping with my theme of white after Labor Day, I wore one of my favorite skirts this week with a white blazer. 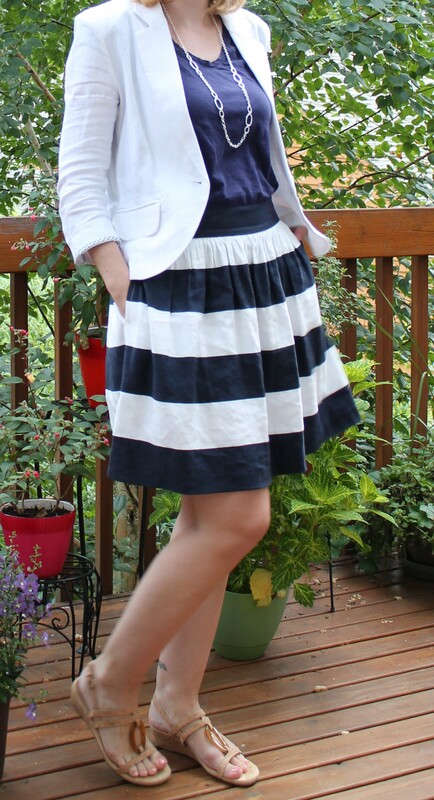 I love the navy and white stripes on the skirt, as well as the flare fit which works well with pear shaped bodies. I just tucked in a lightweight navy blue tee with it and threw on a long necklace and I was ready for work. Next week I get my next stitch fix and I can’t wait to see what I get! I’m hoping for some great new fall pieces even though I’m clinging on to summer for the last few days it’s here.